usual tools for compiling C++, e.g. gcc. KDE 4.2 with development packages for kdelibs and kdebase, i.e. under Ubuntu: sudo aptitude install kdebase-dev kdebase-workspace-dev kdelibs5-dev. Note: You’ll need the experimental KDE 4.2 packages activated as of now, see for example the Kubuntu news on KDE 4.2 RC1 for hints. # start editor and select the plugins - happy coding! If you know good linters drop me a note. But it would be even better if you could write your own linter plugin. It’s pretty easy, take a look at one of the existing plugins for a skeleton & documentation. 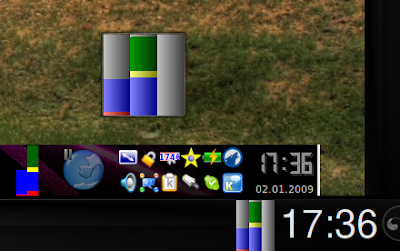 Last year I’ve blogged about the missing system monitor with the three bars for the panel and about its port to Plasma. Meanwhile other developers also did a port called System Status. In a collaboration with them we finally have the applet back in KDE’s subversion, the name is now “System Load Viewer” and it uses the data engine “systemmonitor” that already exists in KDE 4.2. So if you want to have the plasmoid for your KDE4.2 desktop, it should be straightforward to compile/install. On the screenshot you can see the plasmoid in action. There are two instances, one on the panel and one on the desktop. The one on the left is the KDE3 one.